The Aquatron is well suited to accommodate almost any lab-based aquatic experiment. It boasts six large tanks holding a combined volume of over 2,000 m3, as well as a wide variety of smaller tanks, research spaces and equipment. The tank is made from reinforced concrete, with a glass reinforced polyester liner sealed with an epoxy coating. The tank itself sits atop a concrete tank stand with neoprene blocks sandwiched in between to partially acoustically uncouple the tank. The main deck is located at the top of the tank allowing access to all points of the tank surface. 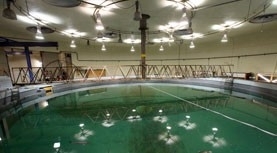 In addition to the main tank, there is an adjoining satellite tank and three associated rooms. The small isolation pool is connected to the main tank via a tunnel, which is 0.96 m wide, 1.12 m deep and 2.74 m long. The tunnel can be divided with drop gates at either end. The satellite tank is 1.12 m deep, and approximately 1.8 m in diameter. Of the rooms, the first is a viewing room with a large glass window allowing a complete view of the tank surface. 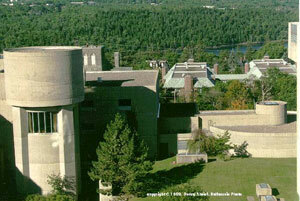 The second room is a large wet lab with flowing seawater and freshwater. The third room is located just above the tank and serves as a base of operations for the tank users. Twenty-two underwater glass viewing ports, approximately 1m2 in size, are located around the perimeter of the tank. Windows are located at various depths to allow viewing at all levels of the tank. The windows are accessed through a viewing deck located below the main deck. The tank is constructed of reinforced concrete and is lined with a glass reinforced polyester liner sealed with an epoxy coating. The tank is separated from the building via neoprene blocks, which are sandwiched between the tank and the tank stand. The tank can be divided into three layers of water with each layer having different physical parameters. Water sampling can be performed through the sampling ports arranged throughout the wall of the tank. The tank is also equipped with a series of viewing ports (25 of which are suitable for human observation or for use with video equipment). The tank is completely insulated with insulated window port covers to minimize sweating and condensation. 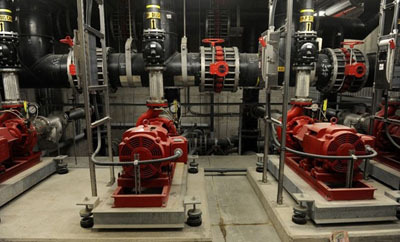 Without the insulation, water would rain down into the building basement causing flooding. 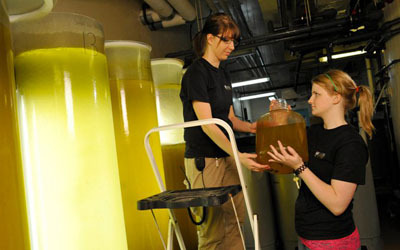 The Tower Tank spans four floors in the Oceanography Tower of the Life Sciences Building. The top of the tank rises just above the fourth floor with the bottom ending just about even with the first floor. The Tower Tank has three associated lab platforms that function primarily as locations for data collection equipment. These lab platforms are located on the first, third and fourth floor levels. 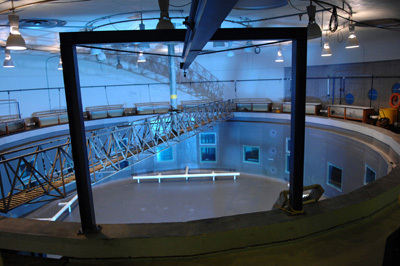 Access to the tank can be through each of the lab platforms. Access to the main drain on the bottom of the tank is through the basement, below the first floor. 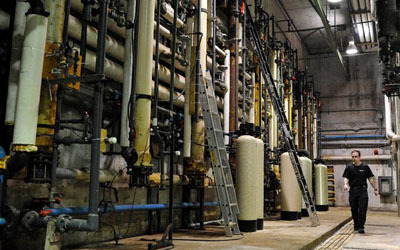 These world-class facilities are backed by our mechanical system, which can provide high quality, temperature controlled seawater and freshwater year round, as well as a professional team of both biologists and mechanical operators who are available to run the systems and help researchers. 16 wet labs.